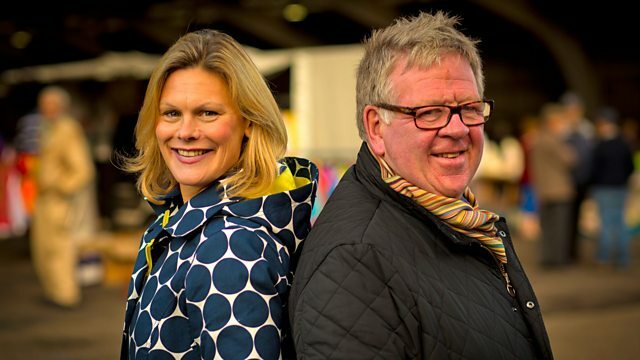 Challenged to spend up to £250 of their own money, antiques experts Phil Serrell and Kate Bliss battle it out at a car boot in West Sussex. Browse content similar to Phil Serrell v Kate Bliss - Car Boot. Check below for episodes and series from the same categories and more! ..and gives YOU the insider's view of the trade! -Catch me if you can. on how to make the most money from buying and selling. Kate Bliss against the duke of dealing Phil Serrell. Coming up - Phil turns a deaf ear to any price he doesn't like the sound of! -Did you say that was 50 quid? -No, no... Is that the wax? Kate gives a masterclass in sticking to your guns. -How does 20 quid sound? And Phil really puts his back into selling! -I'm never going to shift this. -I see what you mean. Yes. No, it's not doable, Philip. This is Put Your Money Where Your Mouth Is! where they're up early in a bid to grab the greatest car boot riches. and they're determined to get them. First up it's the warring wildcat of today's car boot battle ground. and she's not afraid to use it. It's Kate "Absolute" Bliss. Oh, that's quite a loud one! an antiques assailant who is in it to win it. It's Phil "The Fox" Serrell. You have got to get stuck in here. and all of their profits go to their chosen charities. -It's a bit early, isn't it? -and I'm going to have to force a smile. -So, come on, I need the tips. You've been here before. Now, it's like the chariot scene from Ben Hur at half past seven. It's very, very quick and then at half ten, 11 o'clock, it's gone. So this is a buy, buy, buy? What are you going to be looking for? Do you know I haven't got a clue? Whatever they've got basically. -I'm going to try and buy a profit. -I'm with you on that one. -Which way are you going? -I'm going to go that way. to bag the best of the "booter" and pack the most powerful profit punch. he said you had to get in the fight here. My strategy is to buy, buy, buy. It is buzzing here and there's no room for hesitation. Are we going to be able to keep up with this speedy sorceress? And, more to the point, is Phil? in there and buy, buy, buy and buy quickly cos if you dwell it's gone. and furious fight to find a fortune. I could do with a pair of these. They might just be a bit big really. footed it straight to a potential purchase. That's a tenner. I have one at home. The one at home is a different colour, it's a darker colour. -and a lovely thing in the middle. -Can you do it for five? Really, I'll take 7.50. I paid five for it. Can we knock the 50 because I haven't got any change? Only because you have a nice smile. You say all the right things. £7 and a winning smile and Kate's first buy is in the basket! This is a bargain of a first buy. perfect for a family picnic or day at the races. And I know exactly who I'm going to sell it to. My goodness. She's taken off like a rocket! Phil needs to take a long hard look at himself in this 19th-century mirror. -I'll give you 20 quid for it. Thanks a bunch for that one. Blimey, speed is of the essence! How fast was that deal? Let's have a look! the back of that mirror, but Phil hopes to see a profit in it. This would have sat in the dressing room of a lady and gentleman. or your jewellery, this would have adorned your dressing table. You cannot go and buy a modern mirror for £20. If I can't make a profit out of that, I should give up. Mm, swift and confident, that's our Fox! our two rapid relic hunters have quickly netted one buy each. and charges headlong towards his second possible purchase. Excuse me, good sir, how much are your chairs? The three things are £30. Or maybe he just wants a little sit-down? -Would 20 quid buy the three? -It would? You're a gentleman. -They're my brother's and I want to see the back of them. wheels off his £20 furniture haul. So, what's he got to say about his seats? These have got no age at all to them. Probably from quite a well-known Scandinavian retailer. But I think they're quite funky. And they're cheap. That's why I bought them. Saw them, £20 the three. How can I possibly fail on that? Blimey! And, with that, Phil races into the lead. something she hopes will lift her spirits. -What's the best on the labels? Cheers, Kate! Right, what are they? Now, even though they're tarnished, I could tell they're made of silver. And they're a matching set of four. Essentially, these are labels to go on decanters. Now, I don't know the exact date, but I can tell they're not very old. They're certainly quality. And, for £35, they're really not expensive. Yes, Kate certainly knows a bargain when she sees one. with her rival at two buys each. he's just spotted another possible money-maker, an enamel sign. -It will be 80 quid to you. -No, I can't afford that. You could sell that to Catherine Zeta Jones, couldn't you? You might want to work on your spelling, Foxy! Did you say that was 50 quid? No, no. Is it the wax? -Did you say 55? 60. 55 quid and I've bought it. You're a gentleman, thank you very much indeed. and he swipes £25 off the asking price. This is the forerunner of the A3 poster. In the '20s and '30s, brands, formats, they all stayed the same. This is Zetor Service. Zetor is a make of tractor. who's got an interest in these. who might be interested in buying it. Phil thinks he's on the right track for a profit. But Kate is not lost at sea yet. Oh, I like your sea. Is that an oil or a print? All he'd done was seascapes and marine scenes. You can make me an offer. -Yeah, you're going to say, have I got change for 50p? Er... £100 cash, it cost me 80. He is a serious, serious artist. -Where did you buy him? in Islington, some guy's studio. A German dealer. And he had just loads. -I had six all in all, it's the last one I've got left. Go on, then. That makes me a tenner. That's a gamble. That is a gamble. It's a good gamble, trust me, it's a great gamble. but it still cost her a pretty penny. This is very definitely a gut-instinct buy. It's an oil on canvas, apparently by an Edgar Freyberg. But I know nothing about this artist. It's one to research. and I love the way the light is captured in the sea. But also the age of the piece. If you turn it over, you can see it's an early 20th-century canvas. Quite a lot to spend on something I love, but I know very little about. as there's still buying to be done! She wastes no time jumping on a collection of antique animals. of this sort of thing, Britains. And they've become quite collectable. is that they are not in great condition. But I've never seen a kangaroo before. loads of them in Australia. Hm! -How much are these, please? -£10 for all of them. -£10 for all of them? -Could you do 5, madam? Ooh, 5 is better, they're just not in great condition. And Kate's £5 deal takes us to the halfway mark. and who's languishing in the lay-by. Both our dealers arrived with £250 of their own money to spend. leaving £113 in her kitty. costing £95, leaving him with £155 for the rest of the day. -You had to wear your running spikes. -How have you got on? -You weren't wrong, were you? the sun's out, I'm quite enjoy myself. -And there's some good things here, I think. -There are some good things. -Well, I've spent a bit. How about you? Spending money? Spent a bit, yeah. There's one thing I might be quite pleased with. -I don't like the sound of that. I'm feeling OK, put it that way. -Come on, I want to get on. -Go on, see you later, bye. Our whirling dervish dealers mean business. They're not giving anything away to the competition. and it appears she's done just that. And, as ever, keeping her cards very close to her chest. in his natural buying habitat. There was a great pace when we arrived. good things have been bought and taken away. to stay in the fight with the Fox. Yes, indeed, the best bargains get snapped up early at a car boot. So, engines revving, our adversaries head back into the fray. and both resolutely blinkered to any distractions. Phil! Stop being such a cool customer and lounging around. He looks like he's on the case! and bears evidence of some original patina here. I really need to motor on. Kate drives straight towards possible purchase number five. 25. I couldn't bear leaving it when I sold my cottage. -Is it from your house? Could you do a little bit less for me? -It did cost a lot to get made. Slate, yes? If you do 15? she knows somebody with a house called Willow Cottage. Easy sale. but how many Willow Cottages are out there? Thousands! Should be a piece of cake, shouldn't it? With Kate in pole position, Phil needs to get a wriggle on. he hopes will make him more profit than you could shake a stick at! How much is this stick, please? 22 gives me a bit of profit. I was thinking more like 15. 15? I can't do that. I'll do 20 on it. 20 will give me a tiny profit. -I'll shake you by the hand. -Does it make me look distinguished? So, Phil gets just a £2 discount, but he walks off a very happy man. I'm really pleased with my stick, it's a bit Chaplin-esque, isn't it? it's got these silver mounts on it. hallmarked silver, assayed in Birmingham. I would guess round about 1920, something like that. I would think there's probably £15-20 of silver. I think there's a modest profit in that. and goes in on a charm offensive. Hi, there, how much is on the desk? -I was looking around 45-ish. -That's a bit too much for me. Well, funnily enough, I bought one for my son, and I only paid 15. Oh, wow, that was a bargain. -I don't know whether it was, actually. Kate's going to have to employ some textbook haggling techniques here! -Well, I'm going to be really cheeky. Please, you've got to meet me somewhere. I've paid less than that in the past, honestly. Get ready for a dealing masterclass! I can't really take less than 35. -I can't do 35, give me some help? Help me in the middle. I can't, honestly, I can't, I can't do 30. 25. Aha, the "show them the money" trick. Will it work? -Well, 25 I can do. I can't do 25, that's giving it away. Go on. I'll get you a cup of tea. Hm, no. Not even the offer of a cuppa has swayed her. How about the "I'm going to walk off and not buy it" strategy? All right. We'd better press on. And Kate closes the lid on her sixth deal of the day. I love my little child's desk. and he loves to keep all his secret stuff inside there. Now, the stallholder thought it was Victorian. I think it's a little bit later, early 20th century. But it's got a great little brass sliding inkwell, which I love. Phil has harnessed his fifth purchase for £10. This is a French pony or donkey collar. and the leather here wears away. I think that's a bit more saleable. and has snagged some vintage finery! I've been looking for some vintage items for ages. And I finally found some. We've got a great 1970s graphic print shirt. And a beautiful 1970s sea green dress which you could more than wear today. So, £14 the two. Bargain! And, with that, Miss Bliss calls it a day. Well, I'm all done, and I'm pleased as punch with my purchases. I knew I had to be really speedy here, and so motor on I did. It's just as well. Look around me. People are going home already. but Phil is determined to secure one last item before the market closes. -How much are these measures, please? -I've been asking 15 a set for them. -those are my house rules. Ooh, he drives a hard bargain. £10 for the measures, and Phil has had his fill. And how do you know you're going to get a pint? It's a measure. The French equivalent of our English imperial measure. And this guarantees the amount you're going to get. and they cost me the princely sum of £10. And if they don't make a profit. I've been short-changed. our speedy dealers finally apply the brakes, and tot up the totals. They both started the day with £250 of their own money to spend. with her seven purchases costing £191. Phil is sure he's a shoo-in with his six items that cost £135. But the only thing that matters now is profit. and now it's time to compare their wares. Well, was it speedy or not? If I hadn't got a shift on, I wouldn't have any of this. -I've looked at your things. and thought, that is lovely. normally other people will, and it's a good thing. I've got to say to you, I'm not really sure that this is me! -Size maybe! You never know. I'm not sure about this. I think it needs a plough. But I do like this. That's my sort of thing, super silver collars. -I'm prepared to sell you something. -I've friends who live at Willow Cottage. -I think we need to do some talking. Come on, we'll talk about this. but now, out-and-out selling warfare lies ahead. if they're to emerge victorious. Phil is analysing his rather eclectic haul. That car boot is harum-scarum. Get in, get it bought, and get off. Now, my tractor sign. I'm in tractor heaven around here. specialises in selling all things tractor, and tractor memorabilia. So, I'm hoping that will show me a profit on the £55 I paid for it. where there is now a carriage and horse museum. So, I'm hopeful I can sell that there. Now, this is a 19th-century mirror. It's made out of mahogany. I'm hoping that's going to make between £40-60. there has to be a profit in those. Look at that for a piece of elegance. who needs to be elegant, and can offer me a profit on £20. Phil also needs to sell the Scandinavian chairs and footstool. Over in Herefordshire, Kate is feeling confident about her hoard. I had a great time buying at the car boot at Ford. Most things were pretty affordable, as you would expect at a car boot. And I'm really pleased with the selection I've got here. Now, my animals were a bit of a punt. who might like to have these on display. although they've got a lovely Victorian style. They're cast, they're silver, there's definitely a profit in those. I love the desk, simply because they don't make them like this any more. I think it probably dates from the 1940s. It would be great to see it used, perhaps. My vintage clothing is a bit of fun. and I think a vintage shop would take those off my hands, no problem. But the piece de resistance is my painting. It was my most expensive piece. But I've now done a little bit of research. Edgar Freyberg was a German artist who was born in 1927. And I now know that seascapes just like mine were really his thing. paintings like this one will make anything from £200 up to £500. So I think that is my winner! and the wicker bottle basket. into profit, and accumulate the most money for their chosen charities. and the money has changed hands, no deal is truly sealed. at Hartlebury Castle in Worcestershire. He paid £10 for it, but can he saddle up a pretty profit? This place has a big connection with horses. Horse-drawn. -Horse-powered. All things horses, doesn't it? I was kind of hoping, let me take this off. I was hoping you might want to buy it off me. Because it suits you, I think. It's a change from the scarf. -Can we try this again? -Yes. Tell me what you want me to do. I want you to pay a vast amount of money for this horse collar. Oh, Philip, I can't pay you a vast amount of money. I can pay you a little bit of money. It is like the smiling assassin, isn't it? You get lulled into a false sense of security by this really sweet lady. -I'd like to try and get £40 or £50 for this. I sort of had 30, no? Yeah, quickly, I want to get out of here. Here you are. All the best, get out while the going's good! but hard taskmaster Mary's not done with him yet! ..do you want to have a go at pulling the cider press? -It was only a small pony. So, this isn't ever going to work. I'm never going to shift this. Yes, it's... No, it's not doable, Philip. take me some old time to do this. Yes, come on, Phil, put your back into it! high spirits, with her silver drinks labels. can she tempt shop buyer Candice into a purchase? -So, I mean what they are is they are decanter labels. -They are silver and English hallmarked. -Mind if I take a look? -Yeah, take a closer look. so they are pretty modern. Could you see them fitting in here? so that would blend in well. Let me just get one. Ooh, you have some nice ones there. -Triple wing neck. It's lovely. Oh, yeah, that looks lovely, doesn't it? normally at around the couple of hundred pounds mark. I would be willing to pay between £80-£150. -I think they look great on the decanters. -Yes, I think so, too. and I think polishing them up made all the difference. -What do you think of it? -I think it is perfect for Archie. in the bedroom to do his homework. putting £30 into her profit purse. And not to be outdone, Phil thinks he's walking the walk to victory. my silver-mounted walking stick to their props department. but will theatre assistant Gemma want to take it off his hands? Nor for yours, neither. You have ungently, Brutus, stole from my bed. Philip, how are you? Good to see you. -of cast I might have for you. -There are always roles available. -Well, that's what I was thinking of. I was thinking for your props department. -Fine specimen he is, too. -I can see that. Bit of '40s. Bit of dandy. -Very dandy. Wouldn't that look fantastic in one your productions? It is a lovely stick, but it is just a stick. -I was hoping that I might get 50 quid for it. -As close to 20 as you can come down to. I tell you what, my one and final shot is 30.
both heels over there with the stick. Can you do that? Would you have any other vacancies, at all? No, no vacancies at this time, I'm afraid. of the West Midlands Safari Park and frolic to their hearts' content. I was hoping for a wildlife park, to sell my little toy animals. but I've brought my little toy animals for you. Spread them out on your safari vehicle here. furry coating, almost. They are not just painted. The paint has a texture. They are not in perfect condition. for a wildlife set, if you like, for a child's set to play with. I think they date from the very early part of the 20th century. -What do you think of them? -They are very interesting, aren't they? -as they are made of lead. -It would be done under supervision. I was looking between, sort of, between £50 and £100, very loosely. -What would be your, sort of, price? probably split the difference. 75. I have to say, they are not mint condition. -with 65, something like that. -Yeah, I think that is fair enough. -Are there lions lurking around here? there are some lions waiting. -they will be, so we should go. -Right. I'd best be on my way, Bob. and her balance sheet expands by a pretty wild £60. an unusual audience and with so many eyes pinned on me. which I think is a roaring success. which brings us to the halfway mark. so who's blazing a trail and who's dragging their heels? racking up a profit of £228. with a smaller profit of just £40 in his pocket. So, Miss Bliss has an impressive lead on her rival. if he's to stand a chance against this vixen of the vintage. and Phil is just about to take a big one, with his tractor sign. a real gamble, because it is going in unreserved. Cost me £55. Could make a fiver, could make 100. Agricultural and Machinery Auction is just about to start! Lot 507, and this lovely Zetor sign there, gentleman. There you go. £100, for it. 100, to go on it. £100. 100. 100. 100, I've got. £100 bid. £100 bid. At 110. 110, 110. 120, 120, 120.
with the dress and shirt that cost her £14. and is hoping owner Nina will fall in love with them. Well, I'm hoping these might just be of interest. The dress is, perhaps, the nicer of the two. And you have got a shirt there. I think it's 1970s. -So, do you think I am right on the date? -I think this is late '70s. -So, that is the dress. and the narrow cuffs, rather than the wide cuffs. -So, that is very late '70s? So, are they the sort of thing that you think might go in your shop? who are a bit adventurous with their vintage. So, I think that would be, you know, quite fun, actually. Yes? All right. So, what sort of money do you see them at? I would probably pay up to £20 each for them. Could I just shift you slightly up and say around 50 for the two? -Fantastic, I really hope you do well on them. Thank you. And Kate catwalks out, a cool £36 up. So, you see, Phil, buying girlie does work. when she sells her Willow Cottage sign to property developer Adrian. enough money to dig him out of trouble. Keep your fingers crossed. I've got everything crossed. did I have a good sale?! 170 quid. You are an absolute... Oh, I'm over the moon, mate. Phil makes a rather healthy profit of £94.60. -I'm so sorry about that. Well, that's disappointing. Art is all about personal taste. Oh, dear. That leaves Kate up a certain creek without a paddle. She needs to find a buyer - and fast! Phil is now down to his final two items. that cost him £10 to Worcester wine bar owner Mark. There we are, Mark. That makes the set. What do you reckon? They look great, yeah. So, what is the origin of these? -has to be approved by Weights & Measures. So, you can't use these. They are for decorative purposes only. -I just thought that they might do well in a place like this. They'd look the part. Are you interested? You hadn't seen them? No. They are interesting. What are they worth? -I think they should average out at a tenner each. What about if we met halfway and said 60 quid? Would that be a deal? -Yeah, you've got a deal. -You are a gentleman, sir. He certainly is, adding £50 to The Fox's coffers. And that brings the curtain down on his selling spree. And that's the end of my car boot. I just wonder how Kate's got on. Kate, however, still has £90 invested in her oil painting. she heads to mid-Wales, where she's found a potential purchaser. or will it leave her washed up? -This is the picture I told you about. -Oh, is it? Have a little look. Mm, I like it. It is very nice, actually. So, I mean, looking at the canvas, I would put it, sort of, late 1950s. and I particularly like the way he has done the waves. This bit here. It is quite wispy and really alive. We have got an artist who paints similar to this. It's very nice. -Do you think it would be something for the gallery? so, if I like it, it gives me the confidence to sell it. That's good. That's what I go on, as well - good gut feeling. Well, money-wise, I'm looking for around the, sort of, £350 mark. -How does that sound to you? -OK. I have seen this artist before. -We tried to buy one years ago. The 300 is probably a little bit heavy. but does Ian throw Kate a lifeline or will this be a shipwreck? and our selling sprinters have pushed the boundaries of bargaining. but only one can take gold. Who will it be? Kate bought seven items, costing £191. Phil made six purchases and spent a total of £135. Put Your Money Where Your Mouth Is champion. -but it went a bit downhill after. You? -I went to a zoo! -I met a whole herd of cows. -What did you take to a zoo? They put me in a bloomin' cider press, pulling the thing round. -I wish I could have seen that! -but in the end it, sort of, went there. -Did you do very well? -Well, let's have a look, shall we? -You did have a journey and a half, didn't you?! -Hellfire. Was that all the painting? -Other bits and bobs, along the way. -A gallery, in the end. -Took a little while, though. -Let's go and have a cup of tea. -260, yeah, that's good for me. push past her rival to a comfortable victory! it was the seascape, in the end, that swung it. I think I gave Kate too much of a tip at the car boot. I said to her, "Get out early and shop." And she did. She absolutely smacked my bottom! at an antiques market in Belgium. Challenged to spend up to £250 of their own money, antiques experts Phil Serrell and Kate Bliss battle it out at a car boot in West Sussex. Kate gives a masterclass in haggling and Phil takes to the stage in order to sell a stick. But who will win at the final curtain?